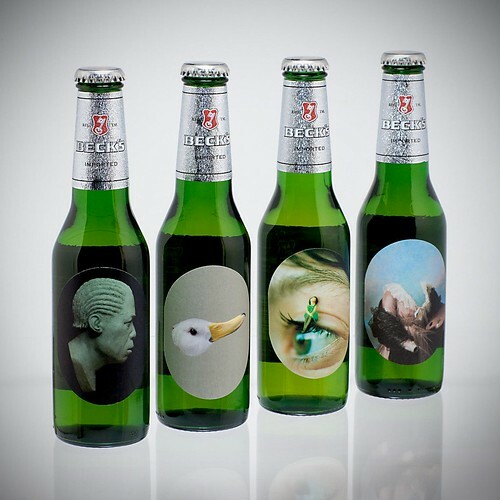 Eye Magazine | Blog | Feel like a beer? Since 1985, writes Cherriss Firbank, the Beck’s company has been issuing special edition labels featuring work by an impressive selection of young artists and designers. Tracey Emin and Damien Hirst were only two of the famous/notorious names who turned up for a one-night-only retrospective at the Royal College of Art in July, to launch the 2008 ‘Beck’s Canvas’ labels. From August 1 to the end of September, 27 million bottles will be on sale, with labels by four recent RCA graduates – Tom Price, Riitta Ikonen, Simon Cunningham and Charlotte Bracegirdle. Head 6, a striking bronze profile of a human head, fills the label by Price (sculpture graduate, 2006). Every day we see people waiting for the bus or in the supermarket queue whom we wish to look at more closely, he explains, but the pace of modern life makes this impossible. Through his sculptures he allows the onlooker to explore and attempt to understand a figure’s momentary physical expression. Price also produces transfixing sculpture animations, which can be seen on his website, blinking back at you out of the screen. Of the four, Riitta Ikonen (communication art and design, 2008) is the artist with the closest connections to graphic design. In the ‘Me again’ series she is photographed wearing quirky costumes to underline the serious issues present in her work. Her ‘Snowflake’ project (top), photographed by Anni Koponen, for example, shows her in a delicately designed snowflake outfit in the forests of Finland, highlighting the effects of global warming on her native landscape. Let’s Stick Together, the image on her Beck’s label, shows a tiny plastic figure balanced on a woman’s eyelashes, demonstrating her ability to create arresting imagery with an unusually poignant edge. Below: Beck’s Canvas labels, 2008: from left, Head 6 by Tom Price; Duckrabbit by Simon Cunningham (RCA photography graduate, 2007); Let’s Stick Together by Riitta Ikonen (CA+D graduate, 2008); Pintora by Charlotte Bracegirdle (painting graduate, 2006).